Herbert Clark Hoover (August 10, 1874 – October 20, 1964), the 31st President of the United States (1929-1933), was a successful mining engineer, humanitarian, and administrator. He exemplified the Efficiency Movement component of the Progressive Era, arguing there were technical solutions to all social and economic problems—a position that was challenged by the Great Depression, which began while he was President. Hoover took office in 1929, amid high hopes for the country and his administration. He had been a distinguished humanitarian, a successful engineer, and a dynamic Secretary of Commerce. He was highly regarded both at home and around the world for his energy, ability, and dedication to human welfare. But his inability to deal satisfactorily with the Stock Market Crash of 1929 and the Great Depression that followed profoundly tarnished his reputation. Through his continued life of public service during 30 years as a former president, Hoover effectively recovered the respect he had lost. Hoover was born into a Quaker family in West Branch, Iowa in 1874. He was the first President to be born west of the Mississippi River. After his father, Jesse Hoover, died in 1880, the young Hoover was orphaned in 1884 when his mother, Hulda Minthorn, died. In 1885, the eleven-year-old "Bert" Hoover went to Newberg, Oregon, to become the ward of his uncle John Minthorn, a doctor and real estate developer whom Hoover recalled as "a severe man on the surface, but like all Quakers kindly at the bottom." At a young age, Hoover was self-reliant and ambitious. "My boyhood ambition was to be able to earn my own living, without the help of anybody, anywhere," he once reported. As an office boy in his uncle's Oregon Land Company he mastered bookkeeping and typing, while also attending business school in the evening. Thanks to a local schoolteacher, Miss Jane Gray, the boy's eyes were opened to the novels of Charles Dickens and Sir Walter Scott. David Copperfield, the story of another orphan cast into the world, remained a lifelong favorite. In the fall of 1891, Hoover was a member of the first entering class of students at the new Leland Stanford Junior University in California. Hoover managed the baseball and football teams, started a laundry, and ran a lecture agency. Teaming up with other students from less wealthy backgrounds against campus elite, the reluctant candidate was elected student body treasurer on the "Barbarian" slate; he then cleared a student-government debt of $2,000. Hoover majored in geology and studied with Professor John Casper Branner, who also helped him get summer jobs mapping terrain in Arkansas' Ozark Mountains and in Colorado. In Branner's class, he met Lou Henry, a banker's daughter from Waterloo, Iowa. Lou shared her fellow Iowan's love of the outdoors and self-reliant nature. "It isn't so important what others think of you as what you feel inside yourself," she told college friends. After graduating from Stanford University in 1895 with a degree in geology, Hoover was unable to find a job as a mining engineer, so he worked as a clerk with the San Francisco consulting firm of Louis Janin. Hoover so impressed Janin that when the British mining firm, Bewick, Moering & Co. asked Janin to suggest an engineer to work for them in Australia, he recommended Hoover. 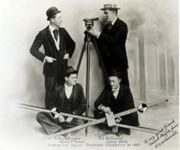 Hoover arrived in Albany, Western Australia, in May 1897, and spent the next year and a half planning development work, ordering and laying out equipment, and examining new prospects. Hoover often traveled to outlying mines by camel, which he called "even a less successful creation than a horse." On one of his trips, he made a detailed inspection of a new mine called the "Sons of Gwalia," which he recommended that his company buy. In time, it proved to be one of the richest gold mines in the world. After less than two years in Australia, Bewick, Moering & Co. offered Hoover a position to oversee the development of coal mines in China. With the job offer in hand, Hoover cabled Lou Henry with a proposal of marriage. Herbert traveled to China by way of the United States, and on February 10, 1899, he and Lou Henry were married in the sitting room of her parents' home in Monterey, California. They would have two children: Herbert Jr. and Allan. The Hoovers arrived in China in March 1899, and he carried out the complex task of balancing his corporation's interests in developing coal mines with local officials' demands for locating new sources of gold. Early in 1900, a wave of anti-western feeling swept China and a nativist movement called "I Ho Tuan," or the Boxers, resolved to destroy all foreign industries, railways, telegraphs, houses, and people in China. In June 1900, the Hoovers, along with hundreds of foreign families, were trapped in the city of Tianjin, protected only by a few soldiers from several foreign countries. Hoover helped organize defensive barricades and organize food supplies, and Lou helped out at the hospital. Tianjin was relieved in late July, and the Hoovers were able to leave for London. Just before leaving, Hoover and his colleagues set in motion a complex scheme to protect the mining operations from being seized or destroyed by reorganizing the Chinese Engineering and Mining Company as a British corporation under control of Bewick, Moering and Company. 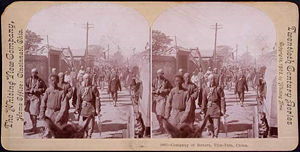 In January 1901, after the rebellion had been put down, Hoover returned to China to complete the restructuring of the company. Hoover oversaw the repairs necessary after the Rebellion, restarted the operations, and began opening new mines. A few months later, Bewick, Moering and Company offered Hoover a junior partnership in their firm, and the Hoovers left China. Between 1907 and 1912, Hoover and his wife combined their talents to create a translation of one of the earliest printed technical treatises: Georg Agricola's De re metallica, originally published in 1556. At 670 pages, with 289 woodcuts, the Hoover translation remains the definitive English language translation of Agricola's work. Bored with making money, the Quaker side of Hoover yearned to be of service to others. When World War I started in August 1914, he helped organize the return home of 120,000 American tourists and businessmen from Europe. Hoover led five hundred volunteers to distribute food, clothing, steamship tickets, and cash. "I did not realize it at the moment, but on August 3, 1914, my engineering career was over forever. I was on the slippery road of public life." The difference between dictatorship and democracy, Hoover liked to say, was simple: Dictators organize from the top down, democracies from the bottom up. Belgium faced a food crisis after being invaded by Germany in fall 1914. Hoover undertook an unprecedented relief effort as head of the Commission for the Relief of Belgium (CRB). The CRB became, in effect, an independent republic of relief, with its own flag, navy, factories, mills, and railroads. Its $12-million-a-month budget was supplied by voluntary donations and government grants. In an early form of shuttle diplomacy, he crossed the North Sea forty times seeking to persuade the enemies in Berlin to allow food to reach the war's victims. Long before the Armistice of 1918, he was an international hero. The Belgian town of Leuven named a prominent square after him. After the United States entered the war in April 1917, President Woodrow Wilson appointed Hoover head of the American Food Administration, with headquarters in Washington, D.C. He succeeded in cutting consumption of food needed overseas and avoided rationing at home. After the end of the war, Hoover, a member of the Supreme Economic Council and head of the American Relief Administration, organized shipments of food for millions of starving people in Central Europe. To this end, he employed a newly formed Quaker organization, the American Friends Service Committee to carry out much of the logistical work in Europe. He extended aid to famine-stricken Bolshevist Russia in 1921. When a critic inquired if he was not thus helping Bolshevism, Hoover retorted, "Twenty million people are starving. Whatever their politics, they shall be fed!" During this time, Hoover realized that he was in a unique position to collect information about the Great War and its aftermath. In 1919, he pledged U.S.$50,000 to Stanford University to support his Hoover War Collection and donated to the University the extensive files of the Commission for Relief in Belgium, the U.S. Food Administration, and the American Relief Administration. Scholars were sent to Europe to collect pamphlets, society publications, government documents, newspapers, posters, proclamations, and other ephemeral materials related to the war and the revolutions and political movements that had followed it. The collection was later renamed the Hoover War Library and is now known as the Hoover Institution. 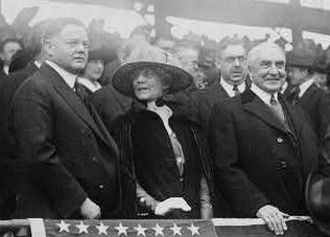 Hoover was touted as a possible Democratic Party presidential candidate in 1920, but he announced his support for Warren G. Harding, and in 1921, Hoover became Secretary of Commerce. As Secretary of Commerce, Hoover became one of the most visible men in the country, often overshadowing Presidents Harding and Calvin Coolidge. As secretary and later as President, Hoover revolutionized the relations between business and government. Rejecting the adversarial stance of Roosevelt, Taft, and Wilson, he sought to make the Commerce Department a powerful service organization, empowered to forge cooperative voluntary partnerships between government and business. This philosophy is often called "associationalism." Many of Hoover's efforts as Commerce Secretary centered on the elimination of waste and the increase of efficiency in business and industry. This included such things as reducing labor losses from trade disputes and seasonal fluctuations, reducing industrial losses from accident and injury, and reducing the amount of crude oil spilled during extraction and shipping. One major achievement was to promote progressive ideals in the areas of standardization products and designs. He energetically promoted international trade by opening offices overseas that gave advice and practical help to businessmen. He was especially eager to promote Hollywood films overseas. His "Own Your Own Home" campaign was a collaboration with organizations working to promote ownership of single-family dwellings, including the Better Houses in America movement, the Architects' Small House Service Bureau, and the Home Modernizing Bureau. He worked with bankers and the savings and loan industry to promote the new long term home mortgage, which dramatically stimulated home construction. 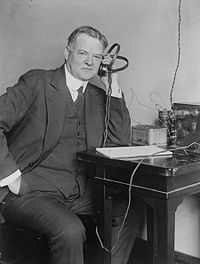 Among Hoover's other successes were the radio conferences, which played a key role in the early organization, development and regulation of radio broadcasting. Hoover played a key role in major projects for navigation, irrigation of dry lands, electrical power, and flood control. As the new air transport industry developed, Hoover held a conference on aviation to promote codes and regulations. He became president of the American Child Health Organization, and he raised private funds to promote health education in schools and communities. In the spring of 1927, the Great Mississippi Flood of 1927 broke the banks and levees of the Mississippi River. The governors of six states along the Mississippi asked for Herbert Hoover in the emergency, so President Coolidge sent Hoover to mobilize state and local authorities, militia, army engineers, Coast Guard, and the American Red Cross. He set up health units, with a grant from the Rockefeller Foundation, to work in the flooded regions for a year. These workers stamped out malaria, pellagra, and typhoid fever from many areas. His work during the flood brought Herbert Hoover to the front page of newspapers everywhere. In 1928, when President Coolidge declined to run for a second term of office, Herbert Hoover was urged to become the Republican Party candidate. Hoover’s reputation, experience, and public popularity coalesced to give him the Republican presidential nomination. He campaigned against Al Smith on the basis of efficiency and prosperity. Although Smith was the target of anti-Catholicism from the Baptist and Lutheran communities, Hoover avoided the religious issue. He supported prohibition, tentatively calling it a "noble experiment." Historians agree that Hoover's national reputation and the booming economy, combined with the deep splits in the Democratic party over religion and prohibition, guaranteed his landslide victory. On poverty he promised: "We in America today are nearer to the final triumph over poverty than ever before in the history of any land." Within months, the Stock Market Crash of 1929 occurred, and the nation's economy spiraled downward into what became known as the Great Depression. Even if the Hoover presidency has a negative imprint on it, it must be noted that there were some important reforms enacted under the Hoover administration. The President expanded civil service coverage, canceled private oil leases on government lands, and led the way for the prosecution of gangster Al Capone. He appointed a commission which set aside 3 million acres (12,000 km²) of national parks and 2.3 million acres (9,000 km2) of national forests; advocated tax reduction for low-income Americans; doubled the numbers of veteran hospital facilities; negotiated a treaty on St. Lawrence Seaway (which failed in the U.S. Senate); signed an act that made The Star-Spangled Banner the national anthem; wrote a Children's Charter that advocated protection of every child regardless of race or gender; built the San Francisco Bay Bridge; created an antitrust division in the Justice Department; required air mail carriers to improve service; proposed federal loans for urban slum clearances; organized the Federal Bureau of Prisons; reorganized the Bureau of Indian Affairs; proposed a federal Department of Education; advocated fifty-dollar-per-month pensions for Americans over 65; chaired White House conferences on child health, protection, homebuilding, and homeownership; and signed the Norris-La Guardia Act that limited judicial intervention in labor disputes. Hoover's humanitarian and Quaker reputation—along with a Native American vice president—gave special meaning to his Indian policies. He had spent part of his childhood in proximity to Indians in Oklahoma, and his Quaker upbringing influenced his views that Native Americans needed to achieve economic self-sufficiency. As President, he appointed Charles J. Rhoads as commissioner of Indian affairs. Hoover supported Rhoads' commitment to Indian assimilation and sought to minimize the federal role in Indian affairs. His goal was to have Indians acting as individuals not as tribes and assume the responsibilities of citizenship which had been granted with the Indian Citizenship Act of 1924. 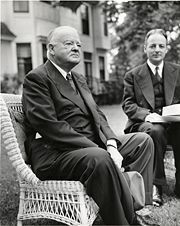 In the foreign arena, Hoover began formulating what would be known as the Good Neighbor Policy by withdrawing American troops from Nicaragua and Haiti; he also proposed an arms embargo on Latin America and a one-third reduction in the world's naval forces, which was called the Hoover Plan. He and Secretary of State Henry Stimson outlined the Hoover-Stimson Doctrine that said the United States would not recognize territories gained by force. The American economy was put to the test with the onset of the Great Depression in 1929. It was Hoover's vocal stance on non-intervention that led to Democratic attacks that he was a laissez-faire, "do nothing" president, which his supporters denied. On the other hand, his more recent libertarian opponents also deny he was a laissez-faire President and condemn him for being an interventionist. Hoover tried to restore confidence with a series of speeches; his weak speaking style did not help, but the biggest problem was that his predictions of an upturn just around the corner never materialized. Soon after the stock market crash, Hoover summoned industrialists to the White House and secured promises to maintain wages. Henry Ford even agreed to increase workers' daily pay from six to seven dollars. From the nation's utilities, Hoover won commitments of $1.8 billion in new construction and repairs for 1930. Railroad executives made a similar pledge. Organized labor agreed to withdraw its latest wage demands. The President ordered federal departments to speed up construction projects. He contacted all forty-eight state governors to make a similar appeal for expanded public works. He went to Congress with a $160 million tax cut, coupled with a doubling of resources for public buildings and dams, highways and harbors. He appointed a Federal Farm Board that tried to raise farm prices. Praise for the President's intervention was widespread. "No one in his place could have done more," concluded the New York Times in the spring of 1930. "Very few of his predecessors could have done as much." In February, Hoover announced—prematurely—that the preliminary shock had passed and that employment was on the mend. Together, government and business actually spent more in the first half of 1930 than the previous year. Yet frightened consumers cut back their expenditures by ten percent. A severe drought ravaged the agricultural heartland beginning in the summer of 1930. The combination of these factors caused a downward spiral, as earnings fell, smaller banks collapsed, and mortgages went unpaid. Hoover's hold-the-line policy in wages lasted little more than a year. Unemployment soared from five million in 1930 to over eleven million in 1931. A sharp recession had become the Great Depression. In 1930, Hoover reluctantly signed the Smoot-Hawley Tariff Act, which raised tariffs on over 20,000 dutiable items. The tariff, combined with the 1932 Revenue Act, which hiked taxes and fees (including postage rates) across the board, is often blamed for deepening the depression, and are considered by some to be Hoover's biggest political blunders. Moreover, the Federal Reserve System's tightening of the money supply is regarded as a mistaken strategy, given the situation. Hoover's stance on the economy was based on volunteerism. From before his entry to the presidency, he was among the greatest proponents of the concept that public-private cooperation was the way to achieve high long-term growth. Hoover feared that too much intervention or coercion by the government would destroy individuality and self-reliance, which he considered to be important American values. Though he was not averse to taking action which he considered was in the public good, such as regulating radio broadcasting and aviation, he preferred a voluntary, non-government approach. In June 1931, to deal with a very serious banking collapse in Central Europe that threatened to cause a worldwide financial meltdown, Hoover issued the Hoover Moratorium that called for a one-year halt in reparations payments by Germany to France and in the payment of Allied war debts to the United States. The Hoover Moratorium had the effect of temporarily stopping the banking collapse in Europe. In June 1932, a conference canceled all reparations payments by Germany. Increased subsidies to the nation's struggling farmers with the Agricultural Marketing Act; but with only limited impact. Signed the Reconstruction Finance Act. This act established the Reconstruction Finance Corporation, which made loans to the states for public works and unemployment relief. In addition, the corporation made loans to banks, railroads, and agriculture credit organizations. Raised tariffs. After hearings held by the House Ways and Means Committee generated more than 20,000 pages of testimony regarding tariff protection, Congress responded with legislation that Hoover signed despite some misgivings. Instead of protecting American jobs, the Smoot-Hawley tariff is widely blamed for setting off a worldwide trade war which only worsened the country's, and the world's, economic troubles. In order to pay for these and other government programs, Hoover agreed to one of the largest tax increases in American history. The Revenue Act of 1932 raised taxes on the highest incomes from 25 percent to 63 percent. The estate tax was doubled and corporate taxes were raised by almost 15 percent. Also, a "check tax" was included that placed a 2-cent tax on all bank checks. Hoover also encouraged Congress to investigate the New York Stock Exchange, and this pressure resulted in various reforms. For this reason, libertarians hold that Hoover's economics were statist. Franklin Delano Roosevelt blasted the Republican incumbent for spending and taxing too much, increasing national debt, raising tariffs and blocking trade, as well as placing millions on the dole of the government. Roosevelt attacked Hoover for "reckless and extravagant" spending, of thinking "that we ought to center control of everything in Washington as rapidly as possible," and of leading "the greatest spending administration in peacetime in all of history." 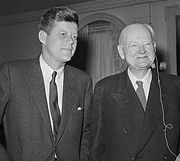 Roosevelt's running mate, John Nance Garner, accused the Republican of "leading the country down the path of socialism." These policies pale beside the more drastic steps taken later as part of the New Deal. However, Hoover's opponents charge that they came too little, and too late. Even as he asked Congress for legislation, he reiterated his view that while people must not suffer from hunger and cold, caring for them must be primarily a local and voluntary responsibility. Unemployment rose to 24.9 percent by the end of Hoover's presidency in 1933, a year that is considered to be the depth of the Great Depression. Hoover was nominated by the Republicans for a second term. In his nine major radio addresses, Hoover primarily defended his administration and his philosophy. He realized he would lose. The apologia approach did not allow Hoover to refute Franklin Delano Roosevelt's charge that he was personally responsible for the depression. Thousands of World War I veterans and their families demonstrated and camped out in Washington, D.C., during June 1932, calling for immediate payment of a bonus that had been promised by the Adjusted Service Certificate Law for payment in 1924. Although offered money by Congress to return home, some members of the "Bonus army" remained. Washington police attempted to remove the demonstrators from their camp, but they were unsuccessful and the conflict grew. Hoover sent U.S. Army forces led by General Douglas MacArthur and aided by junior officers Dwight D. Eisenhower and George S. Patton to stop a march. MacArthur, believing he was fighting a communist revolution, chose to clear out the camp with military force. In the ensuing clash, hundreds of civilians were injured and several were killed. The incident was another negative for Hoover in the 1932 election. Hoover's opponents in Congress, whom he felt were sabotaging his program for their own political gain, painted him as a callous and cruel president. Hoover was badly defeated in the 1932 presidential election. After Roosevelt assumed the presidency, Hoover became a critic of the New Deal, warning against tendencies toward statism. His misgivings are in the book, The Challenge to Liberty, where he talked of fascism, communism, and socialism as enemies of traditional American liberties. In 1938, Hoover went on a tour of Europe and met many heads of state, including Adolf Hitler. In 1940, Hoover spoke at the Philadelphia Republican convention. Numerous reporters, including Drew Pearson, wrote that Hoover was positioning himself for the nomination, which, although taking place as France fell to Hitler's armies, was split among four candidates, the isolationists Thomas Dewey, Robert Taft, and Arthur Vandenberg, and the eventual winner, and anti-Nazi, Wendell Willkie. Hoover said that Hitler's victory over Europe was assured, and what America needed was a man as President who could do business with Hitler, and who had never alienated him. This is detailed in the Charles Peters book, Five Days in Philadelphia. Hoover strongly opposed the Lend Lease program of military aid to Britain. Based on Hoover's previous experience with Germany at the end of World War I, in the winter of 1946-47 President Harry S. Truman selected Hoover to do a tour of Germany in order to ascertain the food status of the occupied nation. Hoover toured what was to become West Germany in Field Marshall Herman Goering's old train coach, and produced a number of reports sharply critical of U.S. occupation policy. The economy of Germany had "sunk to the lowest level in a hundred years." In 1947, President Harry S. Truman appointed Hoover to a commission, which elected him chairman, to reorganize the executive departments. This became known as the Hoover Commission. He was appointed chairman of a similar commission by President Dwight D. Eisenhower in 1953. Many government economies resulted from both commissions' recommendations. Hoover died at the age of 90 in New York City at 11:35 a.m. on October 20, 1964, 31 years and seven months after leaving office. He had outlived his wife by 20 years. By the time of his death, he had rehabilitated his image and died as a beloved statesman. He had the longest retirement of any President. Hoover and his wife are buried at the Herbert Hoover Presidential Library and Museum in West Branch, Iowa. Hoover was honored with a state funeral, and it was America's third in a span of 12 months. The others were for John F. Kennedy and General of the Army Douglas MacArthur. The Lou Henry and Herbert Hoover House, built in 1919 in Palo Alto, California, is now the official residence of the president of Stanford University, and a National Historic Landmark. Hoover's rustic, rural presidential retreat, Rapidan Camp (also later known as Camp Hoover) in the Shenandoah National Park in Virginia, has recently been restored and opened to the public. The Hoover Dam was one of his projects and is named in his honor. "I outlived the bastards"—answer to a question of how he managed to survive the long ostracism under the Roosevelt administration. "Wisdom oft times consists of knowing what to do next"
"Democracy is a harsh employer. "—Comment to a former secretary in 1936. "The only trouble with capitalism is capitalists—they are too damn greedy." ↑ Andrew J. Dunar, 1930s Engineering. Retrieved October 1, 2007. Hawley, Ellis, ed. Herbert Hoover: Containing the Public Messages, Speeches, and Statements of the President, 4 vols. United States Government Printing Office, 1974. Hoover, Herbert Clark and Lou Henry Hoover, trans., "De Re Metallica," by Agricola, G., The Mining magazine, London, 1912. Hoover, Herbert C. Addresses Upon The American Road, 1933-1938. Scribners, 1938. Hoover, Herbert C. Addresses Upon The American Road, 1940-41. Scribner, 1941. Hoover, Herbert C. The Problems of Lasting Peace. Garden City, New York: Doubleday, Doran and Company, inc., 1943. Hoover, Herbert C. Addresses Upon The American Road, 1945-48. D. Van Nostrand Co., 1949. Hoover, Herbert C. Memoirs, 3 vol. New York: Macmillan, 1951-52.
v. 3. The Great Depression, 1929–1941. Carcasson, Martin. "Herbert Hoover and the Presidential Campaign of 1932: the Failure of Apologia," Presidential Studies Quarterly 1998 28(2): pp.349-365. DeConde, Alexander. Herbert Hoover's Latin American Policy. New York: Octagon Books, 1970. Goodman, Mark and Mark Gring. "The Ideological Fight over Creation of the Federal Radio Commission in 1927," Journalism History 2000 26(3): pp.117-124. Hart, David M. "Herbert Hoover's Last Laugh: The Enduring Significance of the 'Associative State' in the United States," Journal of Policy History 1998 10(4): pp.419-444. Hawley, Ellis. "Herbert Hoover, the Commerce Secretariat, and the Vision of an 'Associative State,' 1921-1928.," Journal of American History 61 (1974): pp.116-140. Hoff-Wilson, Joan. Herbert Hoover: Forgotten Progressive. Boston: Little, Brown, 1975. Nash, George H. The Life of Herbert Hoover. New York : W.W. Norton, 1983. Romasco, Albert U. 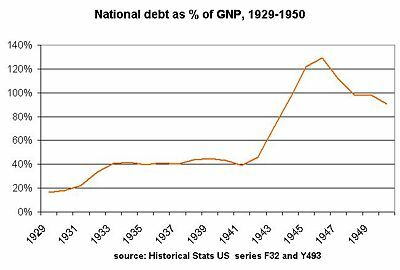 The Poverty of Abundance: Hoover, the Nation, the Depression. New York: Oxford University Press, 1965. Herbert Hoover First State of the Union Address. Herbert Hoover Second State of the Union Address. Herbert Hoover Third State of the Union Address. Herbert Hoover Fourth State of the Union Address. 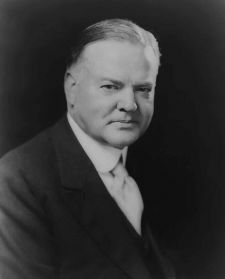 Medical and Health history of Herbert Hoover. This page was last modified on 20 December 2017, at 15:08.